Bits and pieces: Quick-hit review time! Super Happy Fun Fun Inc.
With all of my recent testing in the wireless home Wi-Fi mesh space, I’ve still had some time to try out some smaller items. This post/review highlights a bunch of them. There’s no rhyme or reason as to why I’m bundling them together, other than this is the “clean up your desk” column! Front and back views of the mJoose smartphone case. The mJoose smartphone case ($98, Amazon) comes with three different functions in one handy case. First, it’s a wireless signal booster that works with any carrier’s network – as long as it’s a 2G, 3G, 4G or LTE network (which should cover 99% of carriers). The company says the booster will increase a signal reception by up to 100x, which means fewer dropped calls or the loss of data connections. Second, the case includes a battery pack (2950 mAh), providing extra battery life for your smartphone (up to twice as long). Third, the mJoose case reduces radiation exposure – the company says “independent third-party testing proves our case reduces radiation exposure by up to 70%”. If you’re concerned on that front, it’s an extra bonus. I tested a case for my iPhone 6S – the case has a tiny Lightning adapter on the bottom that I could easily slide my phone into. Two tiny slider buttons on the back would let me power on the signal booster and the extra battery charge when I needed it. In situations where I had only one or two “dots/bars” of wireless coverage, activating the booster saw that go up at least two bars/dots, if not more in some cases. In one area of my town where there’s a notorious lack of wireless coverage, it was nice to have that extra boost. One quick warning – leaving the booster slider in the “on” mode will drain the extra battery power on the mJoose. In my tests, I would forget that I had the booster slider on and then wonder why the juice was gone. In addition, the design of the case will leave the sides of the phone exposed/unprotected. The mJoose isn’t meant to be a protective case, so if you drop your smartphone a lot you might want to be more careful with this (or swap with another case once you don’t need the booster or extra battery charge). Recharging the mJoose is done via mini-USB cable, and it also comes with an audio extender cable if you need to use the headphone jack on your phone (at least my old-school iPhone 6S). The battery portion also adds some weight to the phone, but I think most people won’t mind the extra weight for the benefits the booster and battery pack provide. While I don’t yet have my AARP membership, I am getting older, so I was interested in trying out this headphone and transmitter device from Clarity, a division of Plantronics. The TL100 TV Listener ($170, Amazon) connects to your TV and transmits audio to a headset. The idea here is that the “older person” who needs the TV volume up higher can listen on their headset and not blast the volume so high for other people in the room. The TL100 box transmitter connects to the audio output port on your TV (the old-school RCA red and white cables come with the system). If your TV has a headphone jack as its audio out port (instead of the red/white ports), another cable comes for that option. However, using the headphone jack means that only the headset wearer will be able to hear the sound. The headphone itself is an updated version of Plantronics’ BackBeat Sense wireless headphones. It comes pre-paired with the TL100 box, but can also be paired with regular Bluetooth devices like your smartphone or other music player. I liked how the modern-looking headphones don’t instantly advertise “hearing aid” – you can use these without broadcasting to others your hearing issues. This “complete video game system” from Super Happy Fun Fun, Inc. (they win points for having the coolest company name) aims to “Bring the Arcade Experience of Big Buck Hunter” to the home. The system ($79.99, Amazon) includes a plastic shotgun that you aim at the TV – a small base includes an IR sensor that connects via HDMI to your TV. When calibrated, the game can sense where on the screen you’re firing your shotgun. That technology has been around for years, but the SureShot HD system also includes Wi-Fi, which lets you participate in online shooting tournaments and gives you the ability to download other games (some free, some for extra money) from the Sure Shot Shop. Games that often try to recreate old arcade games onto the TV usually don’t impress me that much (such as those that bundle a ton of old Atari or Sega games onto a game controller), usually because the hardware looks, feels and acts cheap. The SureShot HD system does a better job here with its hardware than those systems do. These kids would score better if they looked at the TV instead of each other. Just saying. Calibration of the gun with the sensor can be a big tricky – you can place the sensor above the TV (if you don’t mind using an adhesive sticker to connect it to the top of your TV) or below it. The base/sensor then scans the area in front of the TV (similar to the way that the Xbox Kinect camera) to find the gun’s location. The system then calibrates by having you shoot red boxes on the four corners of your TV screen. In my tests, I had the base station below the TV screen – this gave great accuracy when I was shooting targets on the lower half of the screen, but then became inaccurate when I shot at things on the top part of the display. Trial and error is best here, and you have to realize that it won’t be as good as the system at the bar/restaurant (I tested this myself at a local steakhouse). Another thing I like about this system is its ability to expand via other downloadable games, as well as the online tournaments. 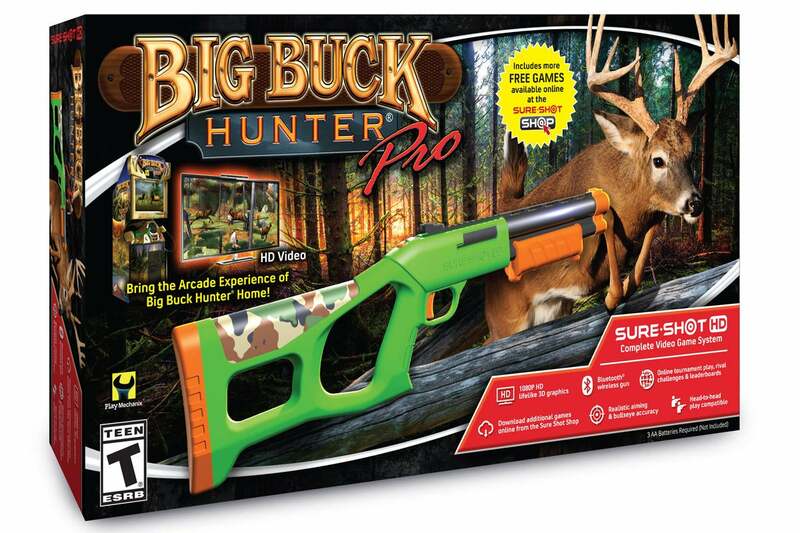 I don’t go out to bars and play the arcade version of Big Buck Hunter Pro, but it looks really good on the TV screen and I wouldn’t mind participating in some of the online events.